Previous post A Followup to the Silence of the Dying entry. 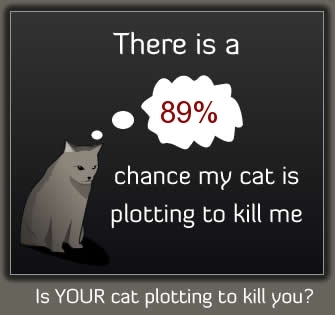 lol,it was 91% for me..
is it the ginger cat you know what red heads tempers are like lol. Just have to work out which cat it is now…. …one of my dogs may be plotting to kill me…. ..didnt do the gardening…but a bottle of french champers instead!! Two cats = mutiny, 93% chance of it!